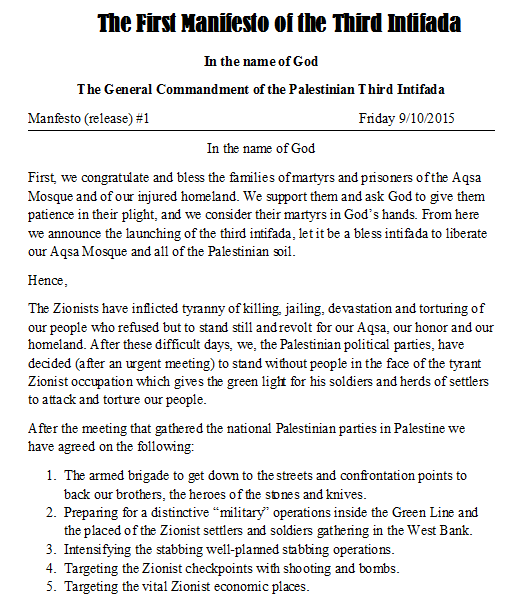 With sad heart I share the #ThirdIntifada manifesto published on Palestinian websites today. The Palestinian political parties excluding Palestinian Authority in accordance with the situation on the ground have decided to launch the #ThirdIntifada. Palestinians have shown so much restrain on the face of the latest assassinations perpetrated by the #Apartheid illegal entity of Israel and under the consent and total silence of the International Community (leaders) and including the worthless apparatus of the United Nations. Israel by its actions pushed for this revolution of liberation. #Apartheid Israel from taking more land and from killing more Palestinians, but they see no other way but to uprise, mimicking South Africa uprisings that ended the #Apartheid Regime of South Africa with the help of the International Boycott Divestment and Sanctions that took place against the Apartheid regime. Palestine starts mourning the martyrs in anticipation of the massacre that approaches. Remember we have a nation with no army, no tanks, no planes, no apache helicopters, no naval ships or anything that say that this battle will be equal . Palestinian militias only count with rifles and the civilian population only have kitchens knives and stones. Marwan Barghouti has spoken up. After a long silence, he has sent a message from prison. His message may well become the new program of the Palestinian liberation movement. leader of Tanzim (“organization”), the youth group of the Fatah movement. peace between Israel and a new State of Palestine. Palestinian Authority was attacked, its services destroyed and many of its activists arrested. court building but we were not allowed anywhere near the accused. hanging in the living room. distributed outside and received with admiration and respect. around whom all Palestinians, Fatah as well as Hamas, can unite. Hamas put Marwan Barghouti on top of the list of Palestinian prisoners whose release it demanded. This was a very unusual gesture, since Marwan belonged to the rival – and reviled – faction. hundreds of Hamas “terrorists” with “blood on their hands”. So what did Marwan tell his people this week? He calls for a Third Intifada, a non-violent mass uprising in the spirit of the Arab Spring. forms of cooperation, whether economic, military or other. security of the growing Israeli settlements in the West Bank. Palestinian products should be promoted. among rightists and most “leftists” alike. It’s political poison. never really accepted in the first place – keeping up the pretense just harms the Palestinian struggle. and isolate Israel (and the US) even more. force to put pressure on both Fatah and Hamas. mentioned anymore. “Normalization” has become a dirty word. militant course, both in substance and in tone. yesteryear harmed the Palestinian cause instead of furthering it. like collaboration, while the expansion of the Israeli “settlement enterprise” goes on undisturbed. approaches our borders. It may well be a harbinger for the Third Intifada heralded by Marwan. For some time now, the world has lost much of its interest in Palestine. Everything looks quiet. and so is the deep resentment of the Palestinians who see this happening before their eyes. well be more important than the leaders outside. PalestineChronicle.com. He contributed this article to PalestineChronicle.com.